The problem with the Pharasees was not that they were a bunch of goody-two-shoes. They weren't merely legalists, obsessed with minutiae. Rather, they were desperate people-pleasers. John tells us that the Pharisees "loved the approval of men rather than the approval of God" (John 12:43). What they craved was distinction. 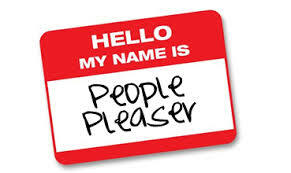 Being a people-pleaser is like having a little handle on your back that others can grab hold of to push you and pull you in all directions. Ironically, most of the time, they are unaware that they have such control over you. That's because it is you yourself who gives them this power. By God's grace, you can break off that handle and set yourself free from the control of others. Oh, to be sure, God wants you to serve others. But such God-pleasing service is to be done out of a love for your neighbor (a love that gives to his real needs), not out of a self-love that can't see his real needs because it is too concerned about its own wants. So what changes can we make today? Paul tells us that our idolatry is cured by a change in ambition - reject distinction before human beings and make it our chief aim in life to please God: "Therefore we also have as our ambition [make it our aim], whether at home or absent, to be pleasing to Him" (2 Cor. 5:9). When you pray, you are not to be like the hypocrites; for they love to stand and pray in the synagogues and on the street corners so that they may be seen by men. Truly I say to you, they have their reward in full. And when you are praying, do not use meaningless repetition as the Gentiles do, for they suppose that they will be heard for their many words. So do not be like them; for your Father knows what you need before you ask Him. But you, when you fast, anoint your head and wash your face so that your fasting will not be noticed by men, but by your Father who is in secret; and your Father who sees what is done in secret will reward you.